Malacca, Malaysia, overflows with tourist hotels and lodgings inspired by the city's Peranakan or Chinese-Malay heritage, which makes the Musang Lena Residences a refreshing change of pace. A collaboration between Kuala Lumpur-based fashion stylist David Chang and art director Soon Lum, Musang Lena comprises two smartly refurbished buildings in the center of Malacca, a UNESCO World Heritage site. Each boasts all the amenities of a plush hotel suite plus well-appointed kitchenettes. The Stable, a one-bedroom two-story unit, once housed hay and horses. Now its exposed brick facade hides a living area exuding bohemian cool, with a buffed cement floor, Saarinen tulip chairs and Pop-art posters. 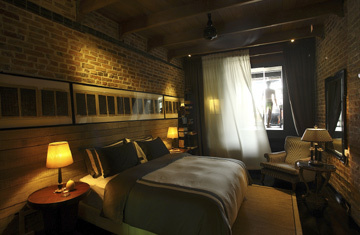 In the upstairs attic-shaped bedroom, large windows offer a bird's-eye view of Malacca's always fascinating street life. The two-bed 45 Lekiu is more sumptuous. Chang and Lum have transformed the typically long and narrow Malaccan house, built in 1941, into an airy hideaway, scraping paint off timber beams, exposing brick walls, and laying black granite and varnished timber floors. The living-dining area, furnished with an eclectic assortment of 19th century Chinese and mid-20th century European pieces, opens onto a bougainvillea-filled courtyard and small lap pool. Upstairs, the master bed and bath lead to a deck with a roomy soaking tub. The third-story terrace, with its view over Malacca's gables and red clay-tile roofs, is best enjoyed at sunset with a cool drink in hand. The only problem with Chang and Lum's luxe lodgings is that, once ensconced, you'll be tempted to stay put. But should you venture out, the cucumber-lime-mint shakes and roasted-chicken-and-mango sandwiches served at nearby Limau Limau Café, a funky eatery run by Lum's wife Sharen Kiu and her sister Jasmine, make for a fine break from Malacca's more storied attractions. The Stable starts at $100 per night; 45 Lekiu from $330. More information at thestablemalacca.com and 45lekiu.com.